There are two ways to import course data from another course: The Import feature and the Backup and Restore features. 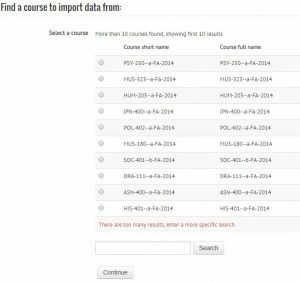 The Import feature we are covering here is the easier of the two and it will only import activities and resources from another course. It will not, however, import student or teacher data, such as forum posts and discussions. It also does not import section headings, labels, graphics or HTML blocks from the source course page. 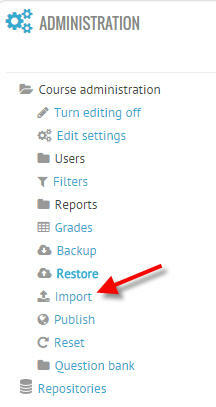 If your goal is only to reuse some of the content you’ve used before on Moodle, use the Import feature. 1. 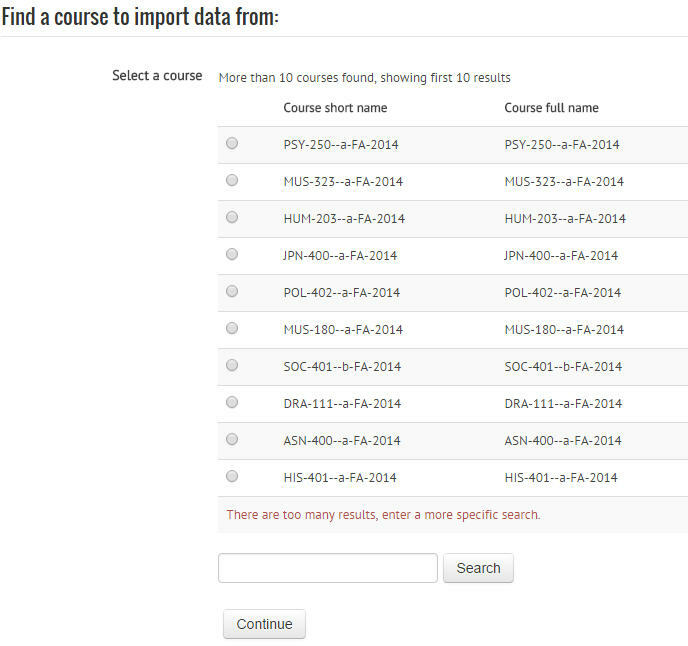 Go to the destination course for the import, and in the Course Administration block, click Import. 2. You’ll see a list of courses and a search box. Type the name of your course (e.g. SPA-110-c) and click Search to see available results. 3. Choose the course you want by selecting the radio button next to it; Click Continue. 4. By default, activities, blocks, and filters from the previous version of the course will be selected. Click Next at the bottom of the page. 5. By default, all material from the previous version of the course will be selected as included. Deselect any material you do not want to bring over to the destination course. Click Next at the bottom of the page. 6. You’ll get a confirmation page; click Perform Import at the bottom of the page. 7. You’ll get a screen showing Moodle’s progress; Click Continue to go back to your Moodle course.